By insisting that she secures her place in history as the Prime Minister who took the UK out of the European Union - Theresa May has also secured another accolade - she is the Prime Minister who lost Scotland. She lost Scotland when she pressed ahead with Brexit, despite 62% of Scottish voters rejecting this whilst completely disregarding Scotland's position or offering a single shred of compromise. Whether you're for or against the European Union, you should still be outraged that the supposedly sovereign will of an entire country can be cast aside in such a callous manner. The Scottish National Party have now confirmed on the official party website, that the Prime Minister cannot stop Scotland from holding an independence referendum. Legally they are entirely correct. Scotland is very unique in that the people of Scotland are regarded as completely sovereign - due to a legal act of Parliament known as the 'Claim of Right 1989.' This act gives absolute sovereignty to the people of Scotland and recognises it in law. In the summer of this year, the act was again recognised by the current British administration. 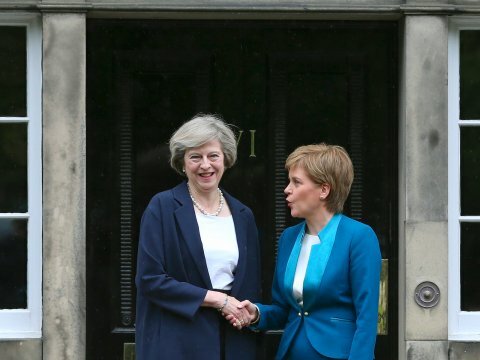 Senior SNP officials have now suggested that if Theresa May attempts to block a legal referendum on independence, that the Scottish National Party will go into the next General Election or Scottish Parliament election asking the people of Scotland for a mandate to enter negotiations with the British Government to deliver independence. A recent poll by Scotland in Union / Survation, showed that only 35% of Scots were against the idea of holding another independence referendum, meaning that up to 65% of the country are at least open to the idea of Scottish independence in the right circumstances - a massive blow to the unionists. There are polls asking how Scots would vote after Brexit that have shown a 52% yes result - and that's before an independence campaign has even begun. Polls had independence support as high as 59% in the immediate aftermath of the Brexit vote - and so it can be safely concluded that a similar aftershock may be felt in the immediate aftermath of Brexit being delivered on the 29th of March 2018 - all while completely ignoring the wishes and desires of the Scottish electorate. There is not a cat's chance in hell of the people of Scotland standing by and allowing a British Prime Minister to inflict such massively damaging constitutional change upon our nation, especially when it goes against the will of the vast majority of our citizens. Theresa May's arrogance about the Scottish position, and her complete denial that Scotland has distinctive interests has led to this situation. It can now be concluded that Theresa May is the Prime Minister responsible for placing the final nail in the coffin of the United Kingdom. Carry on Mrs May - you are now 'Scottish Independence Campaigner of the Year 2018' and you can wear that badge with pride. By breaking up this so called 'union' with such disregard for Scotland, you are pushing us closer to a united Ireland, and you are doing the world a huge favour. Now that the Empire is all but over, perhaps you can write a list of countries that you should apologise to for crimes against humanity. You can start with Scotland and go from there. Nice one, let's do this Scotland! !